A murder mystery and romantic drama, In A Lonely Place mixes genres with stunning success as it delves into a complex psychological profile. In Los Angeles, Dixon Steele (Humphrey Bogart) is a short-tempered Hollywood script writer going through a dry spell. His agent Mel Lippman (Art Smith) urges him to read a popular book and convert it to a screenplay. Instead Dixon invites hatcheck girl Mildred (Martha Stewart), who has already read the book, to his apartment to tell him the story. She leaves after midnight. Mildred is murdered later that night, and detective Brub Nicolai (Frank Lovejoy), who served with Dixon in the war, and Captain Lochner (Carl Benton Reid) question Dixon. His nonchalant behaviour does not erase suspicions, but his neighbour Laurel Gray (Gloria Grahame), an aspiring actress, provides an alibi. Dix and Laurel start an intense love affair, reawakening his writing creativity. But the murder investigation drags on, and Laurel starts to fear Dix's fiery temper, suspecting he is capable of extreme violence. Captain Lochner: Considering that you've never met Mr. Steele, you pay quite a bit of attention to him. Laurel: Hmm-hmm. I have at that. Lochner: Do you usually give such attention to your neighbours? Lochner: Were you interested in Mr. Steele because he's a celebrity? Laurel: No, not at all. I noticed him because he looked interesting - I like his face. Directed by Nicholas Ray and written by Edmund H. North, In A Lonely Place uses a murder case as a catalyst for a tempestuous romance. 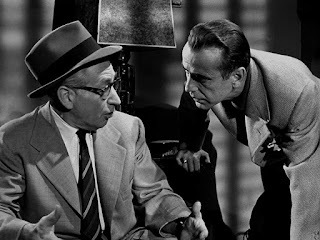 A thematic film noir, neither the murder nor the romance are necessarily at the centre of the story. Rather, this is a dazzling examination of one man's troubled psyche, likely damaged during the war. Dixon Steele is an unforgettable character, in turns brilliant, caustic, and amorous. But his fury is never far from the surface, and provides a dangerous and destructive source of energy. Mel Lippmann (talking to Laurel about Dix): You knew he was dynamite - he has to explode sometimes! Years ago, I tried to make him go and see a psychiatrist. I thought he'd kill me! Always violent. Well it's as much a part of him as the colour of his eyes, the shape of his head. He's Dix Steele. And if you want him, you've gotta take it all, the good with the bad. I've taken it for 20 years and I'd do it again. The film generates magnificent menace by not revealing Dixon's guilt or innocence in Mildred's murder. He is the only one who knows, and it's up to the world around him, from the cops to his agent and his new lover, to react and draw their conclusions. Instead, Dixon's duality occupies the core of the film: he is capable of extreme rage at the slightest provocation, just as efficiently as he can express kindness towards a has-been actor (Robert Warwick), romance Laurel, and immerse himself in creative work. Captain Lochner: You're told that the girl you were with last night was found in Benedict Canyon, murdered. Dumped from a moving car. What's your reaction? Shock? Horror? Sympathy? No - just petulance at being questioned. A couple of feeble jokes. You puzzle me, Mr. Steele. Dixon: Well, I grant you, the jokes could've been better, but I don't see why the rest should worry you - that is, unless you plan to arrest me on lack of emotion. Dixon is both black and white, with plenty of in-between and fast shades of grey, a perfect conundrum at the heart of a film noir. 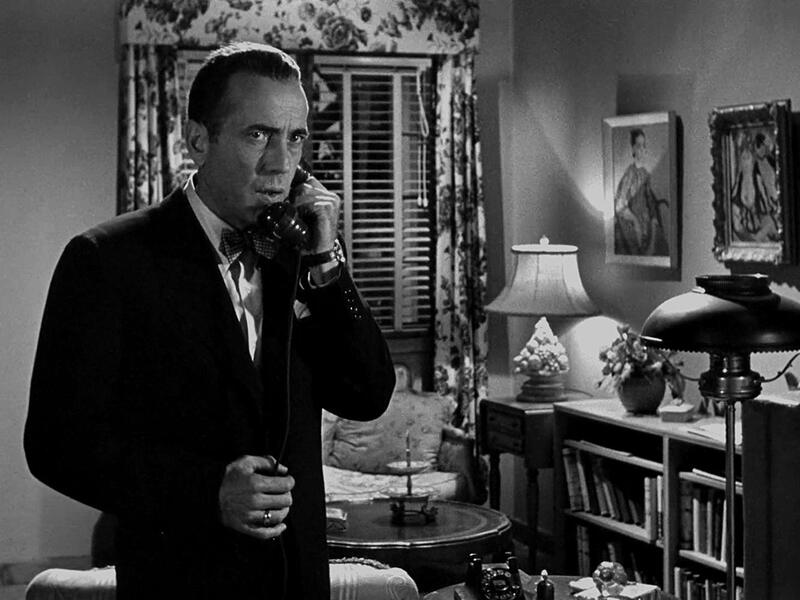 Ray makes excellent use of close-ups, and the crisp black and white Burnett Guffey cinematography sparks the simple but cluttered sets to life. The final third of the film nudges the perspective ever so slightly towards Laurel's dilemma. Entranced by her man, she is also frightened by his violent and impetuous tendencies. The risks and rewards of sticking by Dix are both potentially great, and navigating a path towards happiness will be extraordinarily difficult, even for an exceptionally resourceful and calm woman. Laurel Gray: I said I liked it - I didn't say I wanted to kiss it. 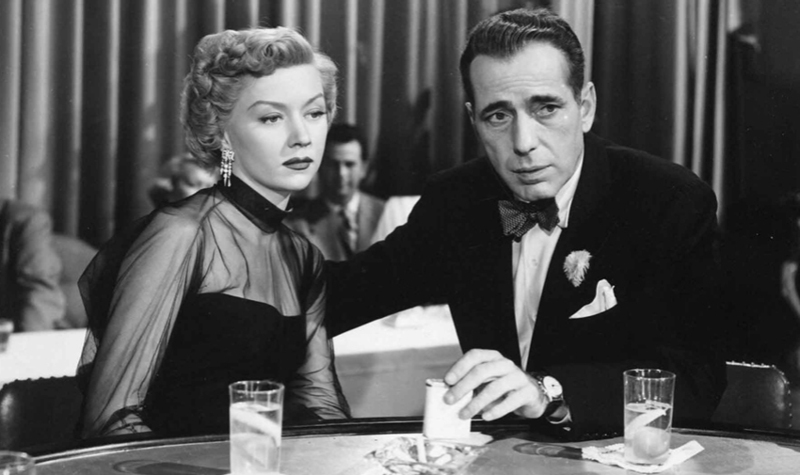 Humphrey Bogart delivers one of his career best performances as a man defined and dominated by his disposition and victimized by breakneck mood transformations. He is matched by Gloria Grahame in top form, an icy cool neighbour and torrid lover capable of dissecting just about every situation with an acerbic stare. Dixon, pondering a line he wants to use in his script: I was born when she kissed me. I died when she left me. I lived a few weeks while she loved me. 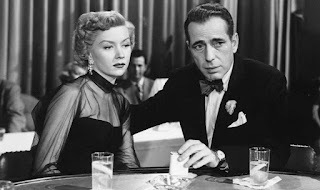 In A Lonely Place is a story of personal turmoil crawling into the open, charm, pugnacity and talent coalescing into a combustible combination.